Danny Lennon celebrates his first anniversary as Clyde manager this month - with the Bully Wee in far better shape than they were 12 months ago. When Lennon took over the reins in November 2017 following the departure of Jim Chapman, his initial task was a simple one - to keep the club in League Two. 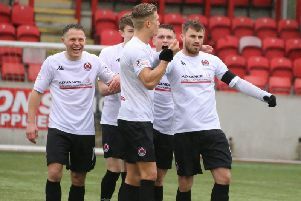 Having survived a last day flirtation with the dreaded threat of a relegation play-off the previous season, the last thing the Clyde faithful wanted was to go through it all again and possibly not be so lucky. Fast forward 12 months and once more they are looking at a League Two exit strategy, only a much more positive one this time. Lennon not only steadied the ship last season, he almost steered the side into an unlikely promotion play-off place after a remarkable winning run just after the turn of the year. That progress has continued this season as Lennon and his rebuilt squad look to plot a course which will end in promotion. The Bully Wee boss is pleased with his first yearly ‘report card’ - but like any manager he always feels he could do better. He said: “It’s all there to be seen. Not everybody knows what goes on behind the scenes but there’s a great amount of work that goes on from the boardroom level right to the fans. “We do have a family atmosphere which I’ll always try to generate within any club. “We’ve built a squad up that’s truly our own and we’re now just trying to maximise the full potential out of these players, as well as improve them. “I’m really happy. The report card says there’s improvement but we can still do a lot better - it’s getting those positive results, along with consistency. “The boys give us everything, but as managers and coaches you are never satisfied with what you have. You’ve got to look for improvement in every single area, even when results are positive. With the January transfer window fast approaching the focus will be on whether the Bully Wee will strengthen for what is shaping up to be a three-way title battle between the Bully Wee, Edinburgh City and Peterhead. He might - but only if he feels there is someone available who can better what he already has. He said: “January’s always an interesting window. It’s not like in the summer where it’s got to suit the player and our club, in January it’s a three-way thing - you’ve got a parent club, the player and your needs. “It would have to be someone that’s available and can come in and help improve us. We’ve got a squad where any one of them can come and step into the first team at any given time.